A Looks Good, Smells Good, Feels Good Kind of Weekend! Sometimes I wonder how we pack so many fun things into one little weekend. Perhaps this time it's because Emily and I started the weekend a little early and skipped our traditional home school work for a field trip. We started out by heading to a nearby town for a little shopping. Not your ordinary shopping mind you, but shopping for the Operation Christmas Child shoe box project that we participate in every year. I think it's a good reminder for us to remember how blessed we are and how little some other's have. Next we went to Grandpa's cheese barn and Sweeties Chocolates. We particularly wanted to visit the cheese barn because Emily collects pressed pennies and I knew that there was a machine there. She has been collecting pressed pennies for many years now and keeps them in a pressed penny book that we found at a Cabela's store. For a long time, they were difficult to find, but recently, a friend told me about Penny Collector Dot Com where you can find listings for pressed penny machines all over the world. We printed of the listings for our home state of Ohio and are trying to see how many we can collect. Finally, on the way home, we stopped at the Sandusky Hollow Nature Preserve and took a little hike. The autumn foliage was quite beautiful and it was nice to stretch our legs a bit. Saturday I spent cleaning our upstairs. Two bathrooms were cleaned. Bedrooms were dusted and vacuumed. I even cleaned out the spare bedroom closet while Emily cleaned her room. We ended up with two bags for the thrift store and two for the trash. While not a particularly interesting way to spend a day, it was good to feel productive. Wrapping the week up seemed to call for some crock-pot apple butter makin' on Sunday afternoon. This is not a quick project as it has to simmer for ten hours, but the aroma that fills the house is so incredible you will think you have entered the gates of heaven. I will let you know how it turns out next week and I will share the recipe. Since I experienced good sights and good smells this weekend, I thought it would be a great addition to review some books that brought about good feelings. And the two books I chose did just that. The first book, The Invisible Boy, gave me a feeling of such great joy because it had a beautifully happy ending. One boy finds himself on the outside looking in so to speak. No one notices him. No one chooses him for their team. No one seems to see him at all giving him the feeling that he is invisible. Until one day when a new boy who is different then the others comes to class. Because he is different, kids laugh at him. The invisible boy wonders which is worse, to be ignored or to be laughed at. He extends the olive branch of friendship and wonderful things begin to happen. Suddenly, he is no longer invisible. 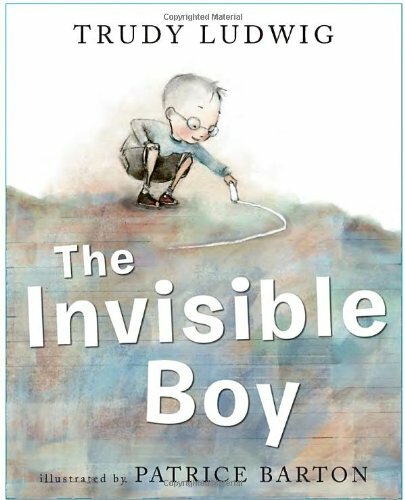 The illustrator did a tremendous job of adding tot he stories depth by portraying everyone in color except for the boy who feels invisible. But as the story progresses, I noticed the boy begin to get a little more colorful with each page until he was finally in full color like the rest of the characters. This book touched something inside of me. The something inside of me that knows what it's like to be laughed at and what it is like to be picked last. It touched a part of me that sees the invisible kids, the part of me that always encourages my daughter to notice the invisible kids and to include them. This book is truely a gem and worth looking for! While the first book took me from sadness to joy, the second book just plain made me laugh. 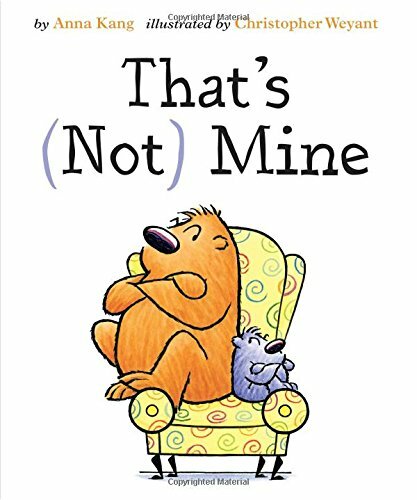 It was called That's (Not) Mine. Two characters spend practically the entire book fighting over a chair. Each one claiming the chair is theirs. Each one trying to get the other one out of the chair. Finally they both end up on the floor and realize how silly it is to fight and decide to go outside and play. But that is not the end of the story because as the two head out, a third character jumps in the chair and claims, "It's Mine." I had to laugh because this is so very realistic where kids are concerned and it reminded me of the time when my nieces fought over a blank piece of note paper one of them found on the shopping mall floor. Busy, Busy, But Finally Done! Some weeks are busier then others and this week was one of those weeks. Since we home school through our former private school, Emily was able to join choir this year and that means that every Monday and Wednesday I have drive her to the school which is thirty minutes away, wait an hour for her, and then drive her home. Normally this isn't so bad, but this week we also had our monthly Cookbook Club meeting on Tuesday. It is a delicious pastime, but it usually has us baking all morning and rushing to get there on time. Cookbook Club is themed and this month our theme was ethnic foods. Emily opted to make chicken curry which is one of her favorite dinner dishes, while I decided to make homemade rolls to go with her choice. You just have to love a club where everyone brings a dish, a recipe, and an appetite. Then, I had to get my tires rotated and get the slow leak in my right rear tire fixed. And you can beleive me when I tell you that Cookbook Club is a much more enjoyable way to spend the morning then waiting in the automotive department of Sam's Club. Especially since I discovered the next day that the repair hadn't taken and my tire was almost flat to the rim. Can you guess where I will be again on Monday Morning (sigh). The week got even busier as the weekend approached since Emily had not one, but two overnight invites. The first was for Friday night and included a cook out and a bonfire at the home of some family friends. The second was for Saturday night and was at her besties house. Since that left Bobby and I with a free evening, we decided to celebrate our wedding anniversary a day early and went out to dinner at a local steakhouse. One of those fun places where you get to throw all your peanut shells on the floor! But the best part of my week, besides my anniversary, was when Emily finished reading Escape From Mr. Lemoncello's Library to me. This book by Chris Grabenstein is nothing less then sheer brilliance. Every day as Emily read to me, I couldn't wait to see what was going to happen next. 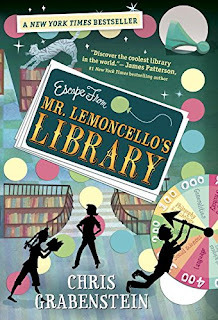 As the children in the book learned to work together to solve clues in the library and to find the secret way out, both Emily and I marveled at the mixture of futuristic high tech, the mention of classic books of every kind, and the general mystery. We were equally surprised at the end of the book to find that Chris had a clue for us to figure out. Emily and I got out the dry erase board and went to town deciphering. Once we had figured out the clue, Emily emailed Chris with our findings and was thrilled beyond belief when he emailed her back. Yep, it was a busy week, but it was a great week! This past weekend we took a mini vacation. After running the farm market all summer, it was nice to have a small break. Bobby, Emily, and I took my mom and sister along with us as we headed to Hocking Hills where we road on the Hocking Valley Railway. We saw some beautiful scenery along the way, but what made the ride special was sharing it with family. The next day we headed to the farm__the Bob Evans Farm where we attended the 45th Annual Bob Evans Festival. We saw sorghum being pressed, we saw a lumberjack show, we saw the pig races, and so much more. The weather was perfect, the entertainment lively, and the company sublime. The broasted chicken wasn't bad either. Although just a couple of days, it was quite a wonderful vacation. And upon arriving home, I found a couple more great surprises. The first was an invitation to next April's Southern Kentucky Book Festival which happens to be one of my favorite events. The next was an indie children's book that arrived in the mail. It was a book by Donna Abbott called Mazey's Dandelion - A Mississippi Puppy Tale. 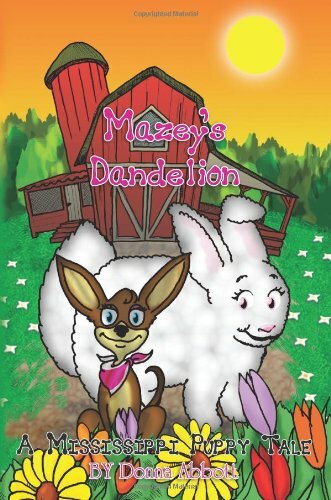 It was the story of a dog named Mazey and her pet rabbit, Dandelion. In the book, Mazey is happy taking good care of her pet rabbit until a problem crops up. Mazey runs out of rabbit food. She despairs until a friendly neighbor helps her find a solution to feed Dandelion. 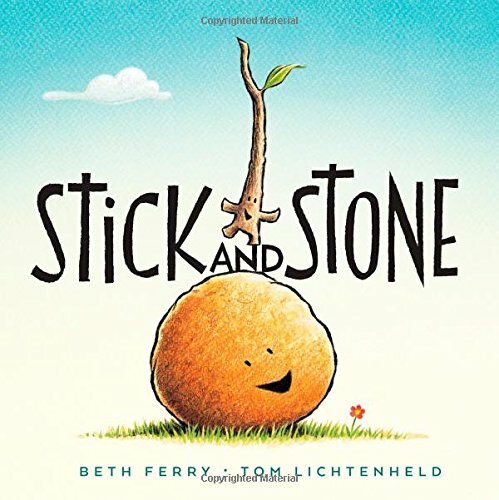 This story would be great for four to six year olds and possibly a bit older depending on the child, and the bright and adorable illustrations will entertain children as well as the text. With Christmas just around the corner, this book might make a great stocking stuffer. I also read a book a bout friends called Stick and Stone by Beth Ferry. I liked this book because it reminded me of the above mentioned vacation with my family because as the book says, "Alone is no fun!" It is also the story about not letting others be bullied and sticking up for friends. 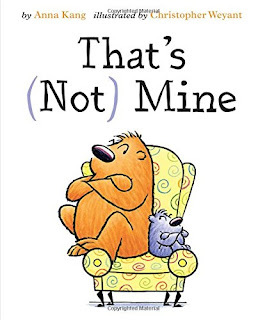 This book consists of simple sentences and simple illustrations, but is anything but boring. This past Saturday was the end of a season__ the end of the farmer's market. I had an amazing time managing the market this year. I met some great new people I would never have met otherwise, I sold lots of baked goods and earned enough money to have my 1940's glider refinished, and Emily had a blast selling magnets and hanging out with her friend Katie. Unfortunately, our last day was cold, rainy, and very, very windy. But I can't complain because despite all of that, I had a great sales day, the dj was fabulous and added a dimension of excitement, and we shared our venue with the chili cook-off which turned out to be a tasty addition. It was anything but boring! And although the title of the first book I read was Meet the Dullards (Extra Boring Edition), the book was like my last market day and was anything but dull. 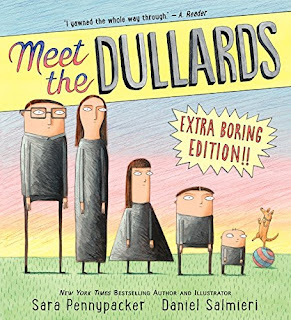 The Dullard parents are dull and want their children to be dull, but page after page shows the Dullard children breaking the dull tradition in the most thrilling ways. They read books, they play outside, and they even join the circus. No matter how hard the parents try to keep their children dull, like when they order vanilla ice cream without a cone and without the vanilla, the children always manage to have some fun when their parents aren't looking. This is the type of book that is so ridiculous you just have to laugh. You might even laugh out loud. 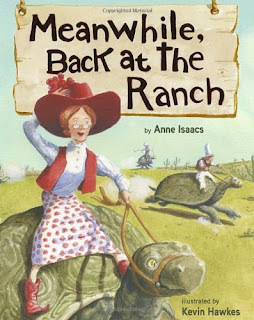 The second book I read was Meanwhile Back at the Ranch and it too was anything but dull. It was a hilarious tall tale about a rich widow who inherited a ranch in Texas where everything is bigger. Even the widow's problems were bigger when every unmarried man for miles around showed up in order to propose marriage. Some creative solutions and a wonderful chef named Charlie eventually lead to a very happy wedding.